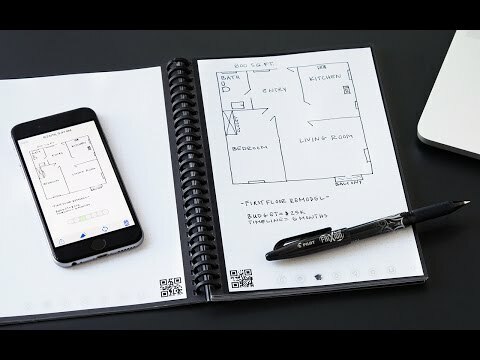 This reusable notebook syncs your pages to the cloud, and then erases itself with a stint in the microwave. Snap a picture of your notes to digitize, then wipe the pages clean by microwaving the notebook with a mug of water on top. Save your thoughts while enjoying the timeless gratification of putting pen to paper. I bought several of these to give as gifts to my staff, and they absolutely love them! The only notebook I use. Prevents me from losing track of my notes. Perfect for a creative person on the move. Is it possible to purchase extra paper? Thanks! Love the notebook. I have used it so much, that my pen ran out of ink. Is there a way to get a replacement? 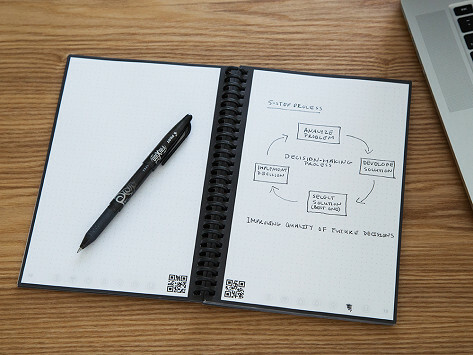 Put pen to paper to the cloud with this reusable notebook. Rocketbook is straight from the future. Snap a picture with the free app to digitize and store your pages . . . then wipe them clean with a stint in the microwave. Once your notes are stored in the cloud, stick Rocketbook in the microwave with a mug of water on top. The heat causes the Frixion pen ink to disappear, leaving only a faint image from where the physical imprint of your past writing was. Makers Joe Lemay and Jake Epstein understand the collaborative value of the cloud but believe “technology creates friction for brainstorming.” Rocketbook encourages the urge to innovate on paper but backs you up with an online copy of your work. Save your ideas with this overachieving notebook and save some trees, too.